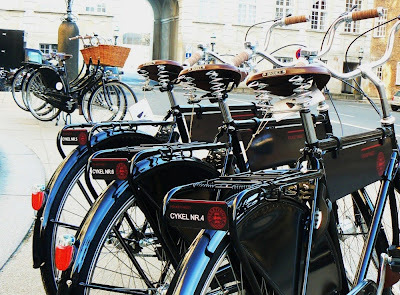 Following up on Marie's post about bikes outside the Danish Parliament - or Folketing - Velorbis have recently delivered a number of bikes to the Parliament. They are neutral bikes in that any MP or employee can use them to ride to meetings at the nearby ministries or into the city centre. The logo is that of the Folketing and each bike is numbered, in best Velorbis corporate bike fashion. As Marie mentioned, politicians of every colour can be seen outside the Folketing, riding their bikes to and from work. Bike 'gear' has appeared on the political landscape a couple of times here in Denmark. An MP and minister, Jytte Hilden, caused a stir when she addressed the parliament wearing tight spandex bike shorts [generally nicknamed Mumble Shorts in the 1980's because you can see the lips moving but can't hear what they are saying]. She was mocked accordingly, as all spandex wearers outside of bike racing and recreation should be [except for Jane Fonda], and raised the question of what is considered apprproprate attire for addressing the Danish parliament. Didn't amount to much apart from folklore. Considering some of the clothes the ultra left-wing parties wear - goofy knitted sweaters and corny t-shirts - unattractive bike shorts are not that weird. Just silly looking. Then there is the famous Helmetgate, as pictured above. The chap in the shot was prime minister at the time - Poul Nyrup Rasmussen. 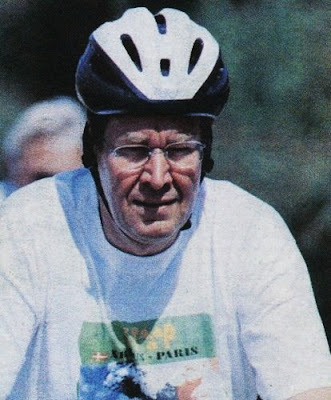 He attended a bicycle rally to protest against the French nuclear tests in the Pacific and borrowed a fellow demonstrator's bike helmet to ride with. Big mistake. He was ravaged in the media for appearing A. in a bike helmet and B. looking so bloody stupid in it. This episode is considered by many to have been the nail in his coffin as prime minister and he and his party, the Social Democrats, were thrashed in the following election. 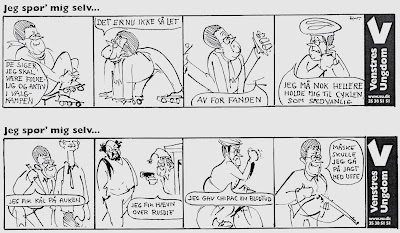 The youth group in the party that won the next election Venstre - published cartoons in a national paper in the election campaign that highlighted the Prime Minister's blunders, among them the Bicycle Helmetgate. A bike helmet felled a prime minister. Not something you'd see many other places. Nowadays, most politicians in the Folketing are wise enough to know that bike helmet legislation and promotion are the surest tools in effectively killing off our thriving bike culture. There was actually a spate of helmet promotion back in the early 90's and bike usage dropped sharply and alarmingly. Let's just hope we learn from that mistake here in Denmark and keep moving towards increasing bike usage insteading of killing it off. More recently, the newly elected Mayor of London, Boris Johnson, felt it necessary to ride his bike to work, without a helmet, in order to take a stand against legislation. Boldly done, Boris. Sometimes he wears one, sometimes not. Personal choice. If there ARE Danish politicians and citizens out there who need a helping hand regarding the science of bike helmets as well as learning about their limitations and their negative effect on bike culture, they can read the Danish website called Cykelhjelm.org. It was made in defence of a bike culture that risks being weakened by potential helmet advocacy. Indeed, most European countries are wary of promoting helmets. The European Council of Ministers of Transport warn against promotion of them, and certainly legislation, in their 2004 report National Policies to Promote Cycling and the European Cyclists' Federation do the same, often citing the evidence that cycling is 20 times more beneficial to health than the little risk of injury. The cyclist federations in Holland, Germany, Hungary, France, UK, Ireland, Spain, and so on, all heed these warnings.